A blank wall is like a like a blank canvas, ready to be transformed by your vision. That’s a premise as promising as it can be intimidating, and one that might lead to sad prints tucked away in a closet or a beautiful painting leaning dejectedly against against the wall for far too long. Your art isn’t doing anyone any good until it’s displayed lovingly and thoughtfully, so what are you waiting for? 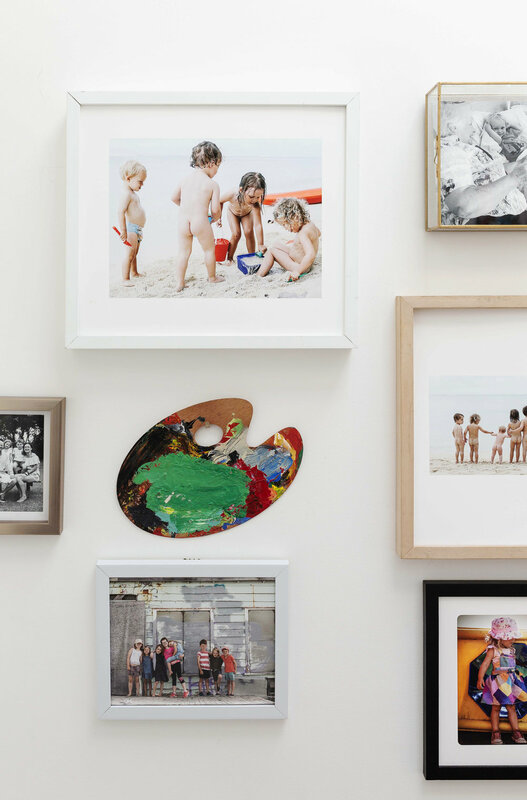 If you have a number of special things that you have curated or collected; consider a gallery wall. From turn of the century Paris to Insta-worthy fame; it’s a popular approach to display a number of items. Here are my recommendations for planning and hanging your Gallery Wall with a bit of extra dimension and pizazz. Create your collection. You want your collection to create a vibe, and communicate your personal tastes within the context of the room and each other. That’s not to say that a good collection needs to be simpatico, people are complex and your collection can and should reflect that! Find pieces that speak the same language, be it in tone, colour or theme. Feel free to experiment with different frames and media, while finding the common thread that brings them together in the little details. 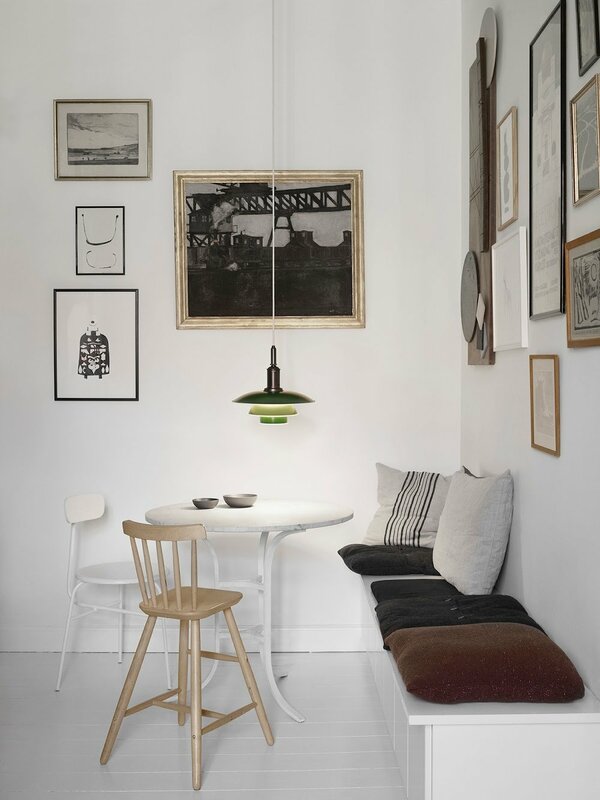 A relationship to the room too can also be nice (but is not necessary); either by vibe or colour palette. That’s Gallery Wall 101. For me, taking it to the next level includes thinking about dimension. My Grandmother’s pearls and Nanna’s painting palette make for a special inclusion, and are totally fitting with my family photo theme. Consider shelves, shadow –boxes or other ways you can display one or two special items. I used a couple of jewelry boxes from West Elm to give dimension. Plan your layout. This is an important step if you don’t want a lot of extra holes in your walls. 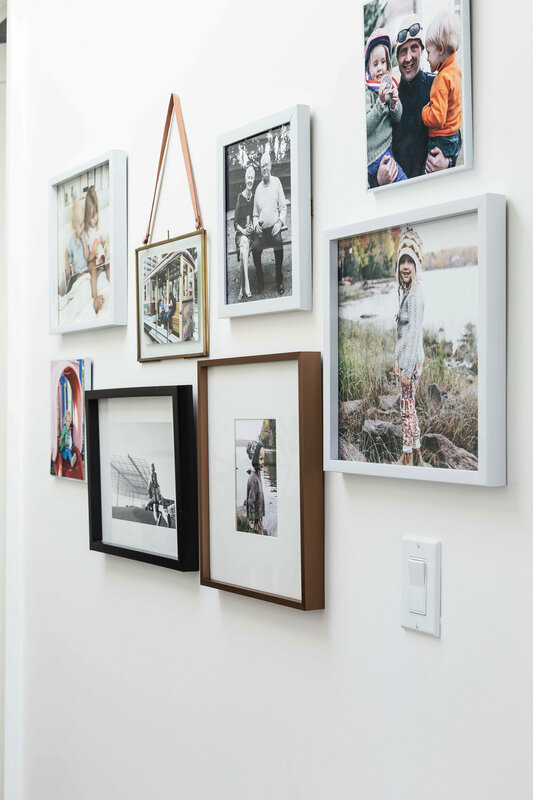 Use scaled pieces of paper on your floor or table as stand-ins to design how your collection will hang on your wall. Too often we are lead to believe that all art should be hung symmetrically, but this is a good instinct to challenge. 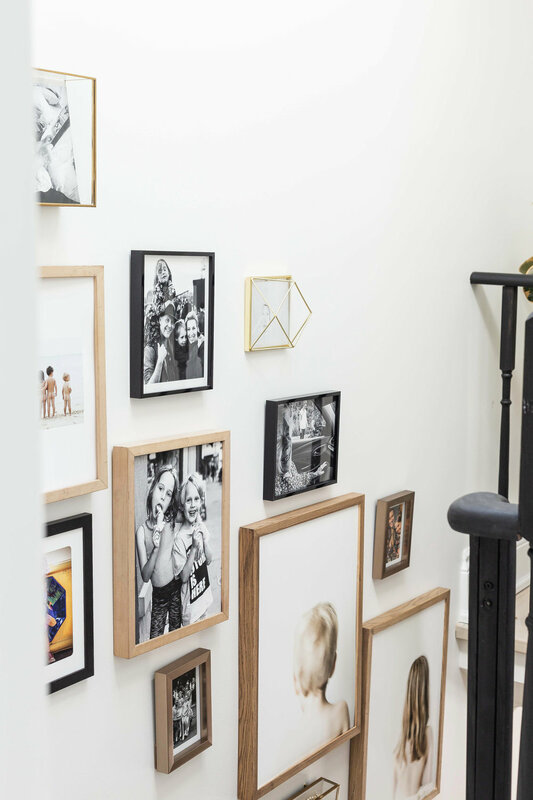 Because a gallery wall especially has a lot of moving parts, allow yourself to see how each piece can work together into a cohesive unit, engaging as much of your wall as you want. Consider the negative - space, that is. Don’t crowd your pieces, let the wall between the work speak for itself. You are creating a path between each piece, and guiding the eye on a journey through your entire collection. I would typically hang large and medium pieces 2-3 inches apart, and smaller pieces 1.5-2.5 inches apart. However, for a cohesive gallery wall, you may want to consider a consistent amount of space between the artworks; it relieves the eye. Find your levels. You want your art collection to sit more or less at eye level. Of course, everyone has different eye levels depending on their height, but a good rule of thumb is to hang your artwork at 57″ on center. That is to say, the middle point of your piece (or the main focal point of your collage wall) should sit 57” above the ground. For a gallery wall, the middle point of the entire project should occupy this level, with the other pieces being built out around it. Your collection & gallery should be organized and displayed in a way that is most appealing to you, so there really is no wrong way to do it! Below are some GREAT inspirational examples I love + links to help you create your own amazing wall. Now enjoy your own personal gallery. And of course, if it needs some additions; here are a few of my own pieces that would be happy to join your collection! (Plus I’m also eager to chat about framing and hanging tips with my clients).